1.Video surveillance: High quality image for monitoring cashier, entrance ,and other important areas. 2.Staff Management: A Simple attendance system combines access control devices which allow you to check staff attendance and get abnormal event notification on smart phone. 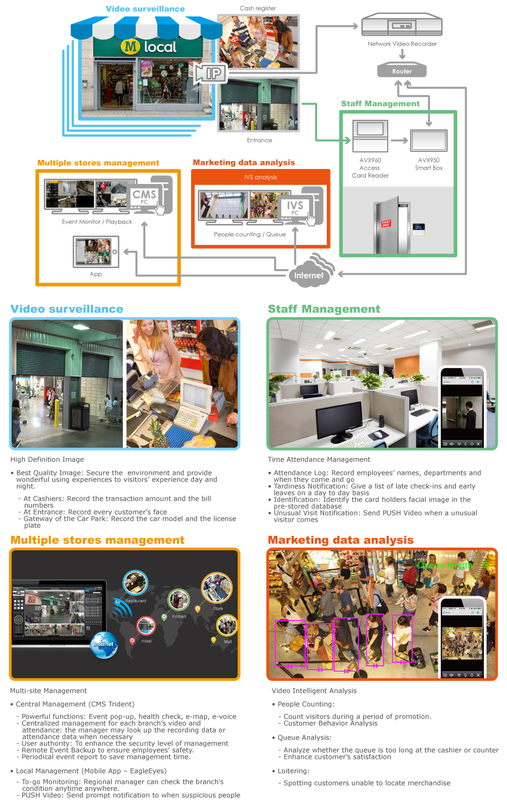 3.Multiple stores management: The headquarters can manage all CCTV devices in branches through CMS. 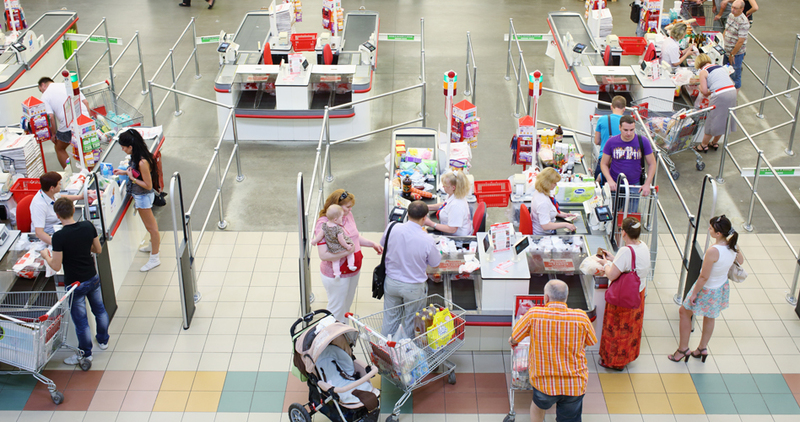 The mobile App allows managers to supervise all stores anytime anywhere. 4.Marketing data analysis: IVS analysis helps you evaluate the effects of marketing activities and optimize store performance. Shop owners are able to know customer visit count per day using Flow Counting built-in in the camera. Regular reports and analysis could later be generated by CMS for labor and promotion evaluation. Integrated with the access control system, the employees’ data will be transferred to and logged in the CMS for access and attendance record. CMS-Lite, the 24CH free software, is exclusively designed for monitoring multiple spots remotely. Common applications are chain stores and branch offices. Users can easily use functions such as live view, playback and backup with this software installed on a normal laptop. 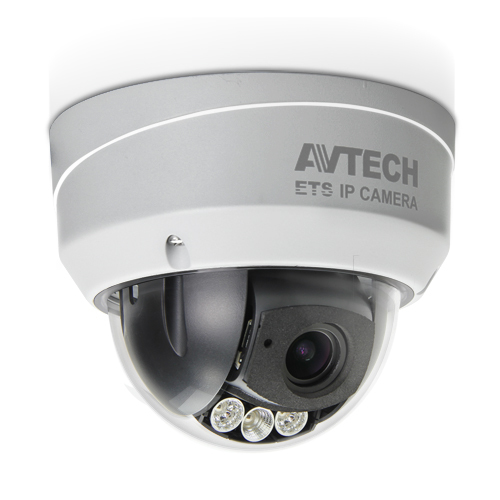 For advanced central control application, AVTECH provides you with 64CH CMS-Standard and 96CH CMS-Professional. What’s more, there are 16CH EagleEyesHD and 4CH EagleEyes for remote surveillance through tablets and mobile phones. Smart Box AVX950, the smart box, is the setup platform and portal to link to AVTECH IoT (Internet-of-Thing) accessories. To monitor each accessory individually linked by AVX950, a series of mobile app named EagleLinkIT is designed. Simply enter the IP information of this smart box on the EagleLinkIT app of the accessory you want to see, and you’ll be able to access the accessory for instant management and control. Access Card Reader This card reader is one of the IoT (Internet-of-Thing) accessories AVTECH designs. It should work with AVX950, the Smart Box, for access control. You can use it to record attendance of each staff with different statuses, and generate reports for evaluation. You can also connect different sensors or alarm devices such as a push button or magnetic lock to record or perform more actions.